Join one of the certified guides on our team for a perfect summer day of hiking in the stunning Pitztal Glacier in Tyrol, Austria. Discover the outstanding views from the top of the Pitzal glacier. Explore the wonderful shapes the Pitzal glacier forms in the Austrian mountains. Follow us to the heart of the Pitztal Glacier, Austria on this fantastic one-day hike. We’ll take you to explore the wonderful mountains and enjoy some outstanding views. This is a unique hike, perfect for a summer day. The Pitzal Glacier is one of the most beautiful glacial areas in the world. Located in Tyrol, it is a popular skiing destination due to its stunning scenery and its long snow season. 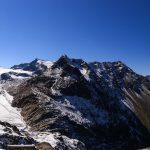 It is also becoming popular among summer sport enthusiasts, such as hikers and climbers, that can take advantage of the skiing infrastructure and ascend high points with impressive views. On this summer adventure, we’ll take you to the heart of the Pitztal Glacier. This loop hike will take us through natural sculptures, glacial mills, glacier snouts, glacial polish areas and bizarre rock formations. We’ll teach you all about how the ice of the glacier shaped the valley. The hike will last approximately 3 hours. So, would you like to explore a stunning spot in Tyrol? Then send the request and get ready for a wonderful summer hike in an unforgettable location! For more summer adventures in Austria, follow us on a hike to Kaltenberghütte from St. Anton or practice rafting on the Lech River. Make sure to bring sturdy hiking boots, sunglasses, a windbreaker, a hat and sunscreen.